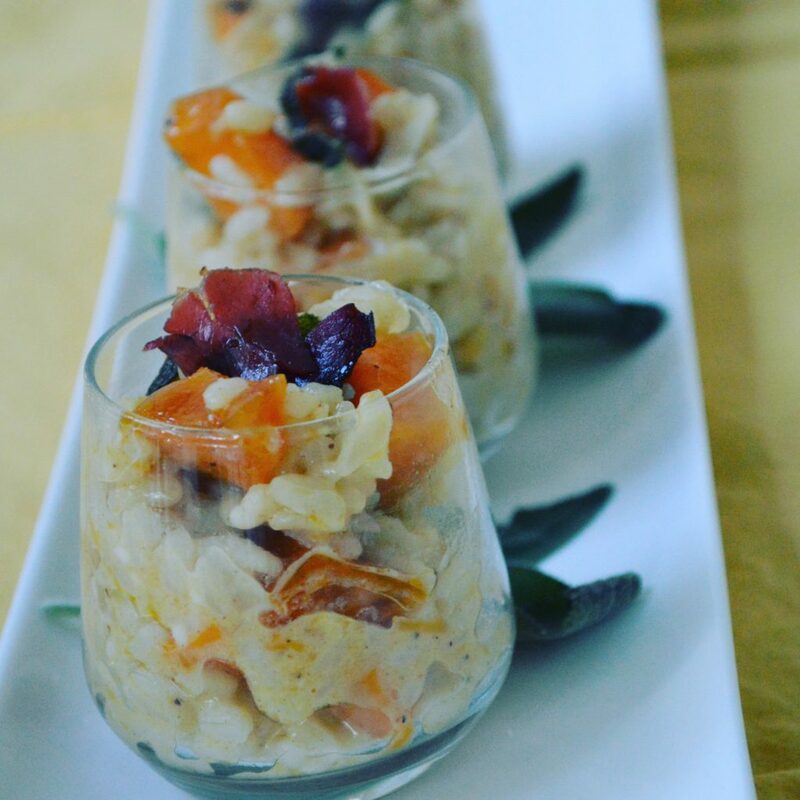 Risotto is one of those comforting Fall dishes that makes us think of turning leaves, picking pumpkins and gathering around a fire on a cold night. And this Butternut Squash Risotto makes the perfect weeknight meal or dish for entertaining, depending on how you serve it. I’ve made it for my family in a big bowl as a side dish to a roast and I’ve served it in small little glasses as an elegant starter to a party. My favorite way was served in this small, hallowed out pumpkins. However you serve it I promise if you like Fall flavors like roasted squash and crispy pancetta, it will be a hit. 1. Place the chicken stock in a medium sauce pan and heat over low. 2. In a medium, heavy bottomed sauce pan place 1 Tablespoon of butter and 1 Tablespoon of extra virgin olive oil. Once the butter just melts add in the diced onion and cook for about 4 minutes until translucent. Add in the rice. Cook until all the rice is coated with oil and rice is turning a little opaque, approximately 3 minutes. 3. Add in the white wine (carefully) give it stir and cook until the white wine is just absorbed. Next add in 1 cup of hot chicken stock and cook, continuing to stir as the rice slowly starts to absorb the liquid. Each time the stock is just about absorbed add in another cup of hot chicken stock. Again, don’t forget to stir! Towards the very end add in about 1/2 of the roasted squash and incorporate. The whole process should take about 22 minutes and the rice should end up with a little stock still in it (not dry) and definitely not mushy. Be careful not to overcook. 1. In a medium saute pan melt the butter over medium heat and add in the sage leaves. Cook until crisp but not burned. Remove from pan and pat dry with a paper towel. 2. Recrisp the pancetta if cooked earlier. 3. 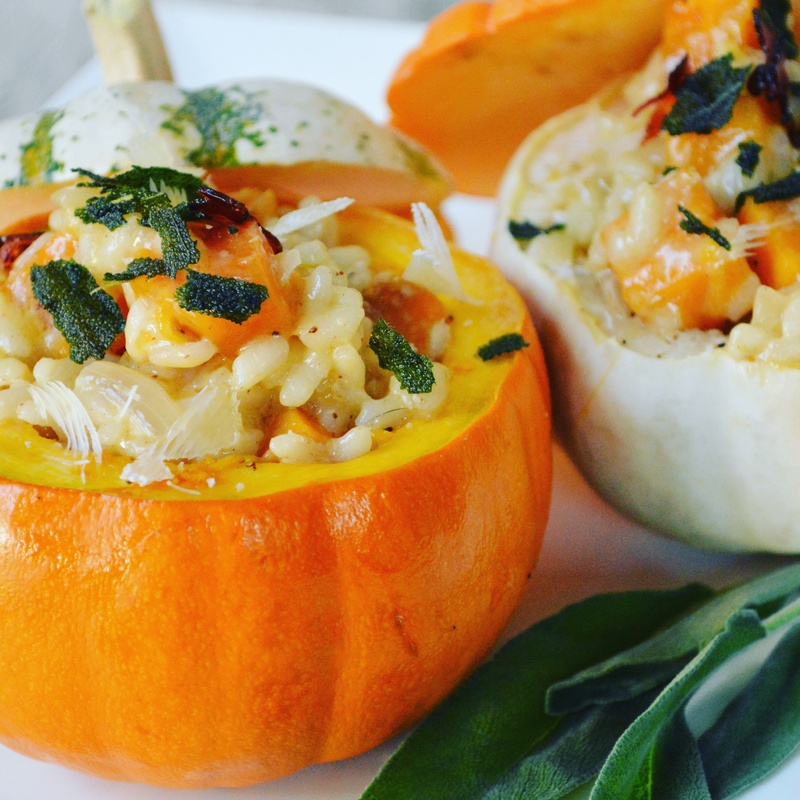 Place the risotto in small shot glasses, a large bowl, or in the roasted mini-pumpkins. Top with crumbled pancetta, crumbled sage and top with shaved Parmesan.